"Modified version of a recipe from Cracker Barrel® restaurant's excellent brunch dish . It can be cooked the day before and reheated or frozen and reheated." Mix potatoes, sour cream, Cheddar cheese, cream of celery soup, onion, 1/4 cup butter, white pepper, and cayenne pepper together in a bowl; spread into a 9x13-inch baking dish. Sprinkle corn flakes and cheese-flavored crackers over potato mixture and drizzle remaining butter over the top. It’s like a fully loaded baked potato, casserole-style, for brunch or dinner. Loved the crunchy topping of crushed cheese crackers and corn flakes. 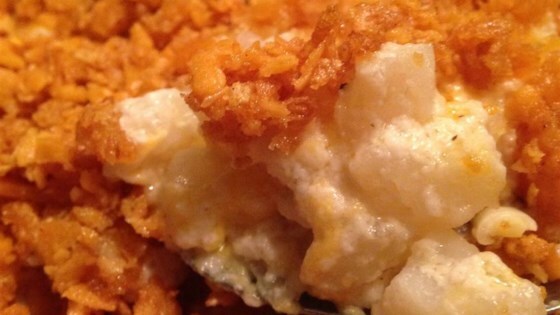 More flavorful and crispier than other suggested toppings for this very typical hash brown casserole. Loved it! I added a little pinch of salt, extra cheese and some crispy bacon crumbles and it was delish!